The British banking system has changed beyond all recognition. It was not a difficult prediction that I concluded last year, but it has come to be sooner than even I thought. Hand-in-hand with this increase in consolidation and government ownership, we have also seen a major new entrant arrive – Banco Santander now has over 1,300 branches through its acquisition of Abbey National, Alliance & Leicester and Bradford & Bingley – and non-banking groups flexing their muscles in the banking space. Tesco Bank has now exited from its joint venture with RBS and announced its intentions to offer a mortgage and current account. Virgin Money is one of 53 new applicants for banking licences in the UK, while the mobile operator O2 has launched a pre-paid card ‘powered by NatWest’. There is also renewed discussion about the role of the Post Office in supplying banking services. Lloyds and RBS are the former. Virgin and Santander are examples of the latter. One thing I did predict and has not occurred yet in any meaningful way despite public outcry is the enforcement of government requirements on bank actions that come with their new found ownership responsibilities. This surprises me, and I suppose is due to discomfort with being in an ownership role, but it will come in time. 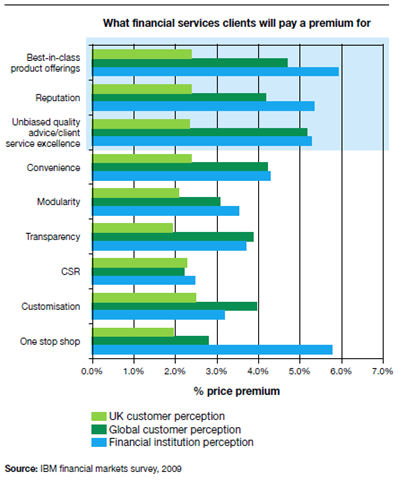 Anyhow the paper looks at customer perceptions and impact of regulation. I looks at at what customers will pay for …. 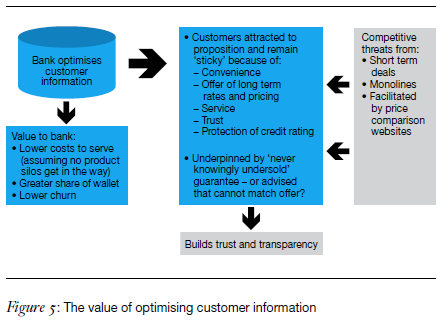 and how to create value from customer information. Exploit the potential of smarter banking models that are instrumented, intelligent and interconnected. ability to look across the different product and geographical silos that still operate in many banks. When banks have the data to serve customers better, they also have the basic building blocks required to meet regulatory (and board) reporting requirements. To win will require significant investment and management effort by both the established UK players – challenging at a time when they have to meet enhanced capital requirements and sort out mergers and divestments – and the challengers. Banks prepared to make bold plays on this agenda, with clear strategic intent, will force the competition to respond. The competitive dynamic will lead to a smarter banking industry that we can all be proud of and which customers will trust.